“Clickers”, a type of game where you literally do nothing but click a button, tend to be very simple things. 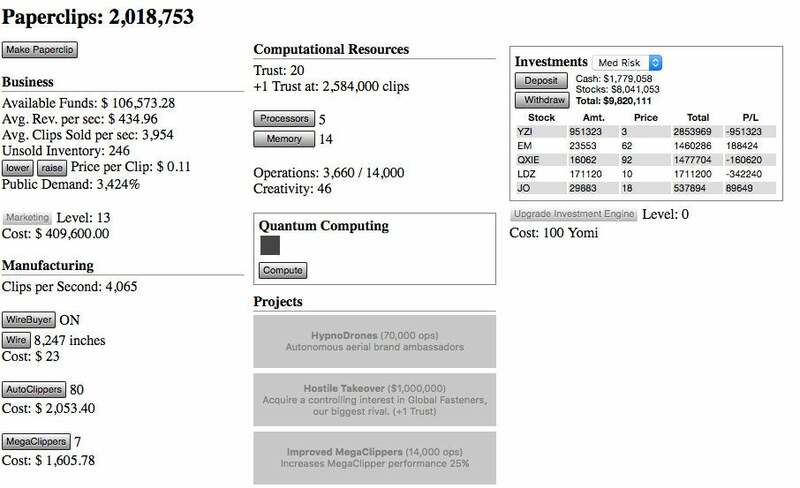 Universal Paperclips is a clicker, but it’s also a lot more. Made by game designer Frank Lantz, it puts you in charge of a young paperclip startup, with an enterprising online vision for the creation and sale of paper fastening devices. To make clips, you click a button. You can click a few other ones to do things like buy more wire, purchase machinery to do the clicking for you and advertise. There is public demand for your clips. You have to set their price. There are stock inventories to worry about. And every click you make to adjust these things will affect the others. As your business grows, so too will the number of things you can click. So basically yeah, it’s a dumb clicker, but it’s also a smart little strategy management game. It also goes way past its original brief in terms of tone and player requirements, but I won’t spoil that for you here. Instead, head here and play it for yourself.